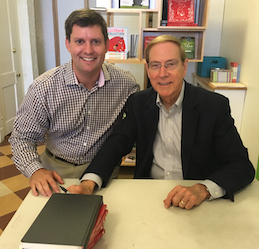 Dr. Gary Chapman is a number-one New York Times best-selling author known throughout the world for his book The 5 Love Languages: The Secret to Love that Lasts. The book, believed to be one of the most widely read in the world, has sold now 12 million copies in English, and has been translated into 40 other languages. Using in-depth research provided by Dr. Paul White, a psychologist who specializes in helping family-owned businesses, Chapman has adapted the Love Languages principles taught in his original book for the business world in The 5 Languages of Appreciation in the Workplace. Chapman and White’s teachings have benefited employees and individuals across a variety of organizations, including Microsoft, Nationwide Insurance, NASA and many others. On August 14, in front of a large crowd at the Byrd Theatre in Richmond, Virginia, Chapman treated the audience – which included a select group of VACEOs members – to a behind-the-scenes look at the research and principles behind the book. APPRECIATION MATTERS. AND IT CAN AFFECT YOUR BOTTOM LINE. In fact, Chapman and White say the need to feel appreciated at work is the same fundamental need as the need to feel loved in family relationships. Under appreciated employees can create a crippling ripple effect across your business. Team members become disconnected from the organization’s mission, and, soon, complaints to colleagues and drama follow. Your customers notice the lack of dedication to their needs. On the other hand, when employees feel appreciated, employee turnover is decreased, sick days are minimized, and employees are energized and give more. Your business emits a positive energy, and customers want to do business with you. Customer satisfaction goes up, and you benefit from a more positive relationship with your staff. Before we speak the language, it’s important to understand the difference between recognition and appreciation. According to Chapman, each of us has a primary and a secondary Appreciation Language, and each language can have a dialect. Chapman cautions the audience not to be alarmed by number five: His background in anthropology tells him there are no human cultures in which people do not touch. He addresses the appropriateness of physical touch in the workplace thoroughly in his book, which we encourage you to read since it also covers specific dialects that are part of each language, and the specific skills and guidelines you need to develop as a leader to effectively express appreciation. 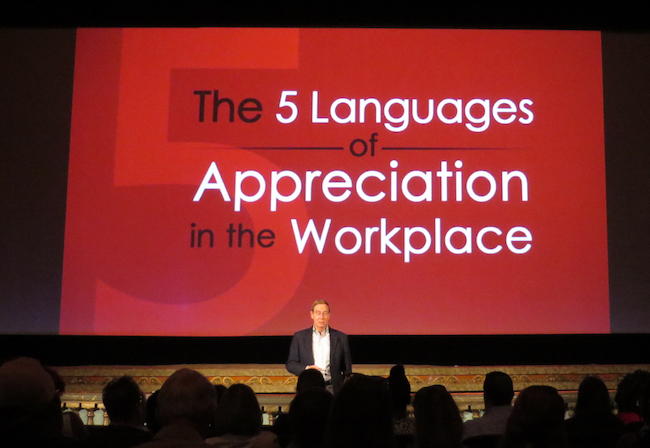 How can you tell which Appreciation Language your employees and co-workers prefer? According to Chapman, there are three informal ways to find out. Ready to empower your organization by encouraging people? Why not purchase copies of 5 Languages of Appreciation in the Workplace for your employees like Todd Mawyer, CEO of TK Promotions, Inc., did? His plan is to encourage his team to take the language evaluation test that’s included in the book and then discuss what they’ve learned together.